We ask for your financial support for our Capital Campaign, as we prepare to celebrate our Centennial Anniversary. Our goal is to raise $1.53 million dollars between June 1, 2018 and November 2019 to fund a new welcome annex with full accessibility to increase access to Holy Redeemer Church for seniors and people with disabilities. You may have attended Holy Redeemer School, or you may be a parishioner now at Holy Redeemer or grew up in the parish or have roots in our Parish, we ask your support for our efforts to continue to be part of the living history in our neighborhood, and to make Holy Redeemer Church open and fully accessible to all for worship services and community events. You can definitely help our “remaining” and “rising”. You can donate to the Capital Campaign with your credit or debit card through our secure on-line PayPal account. 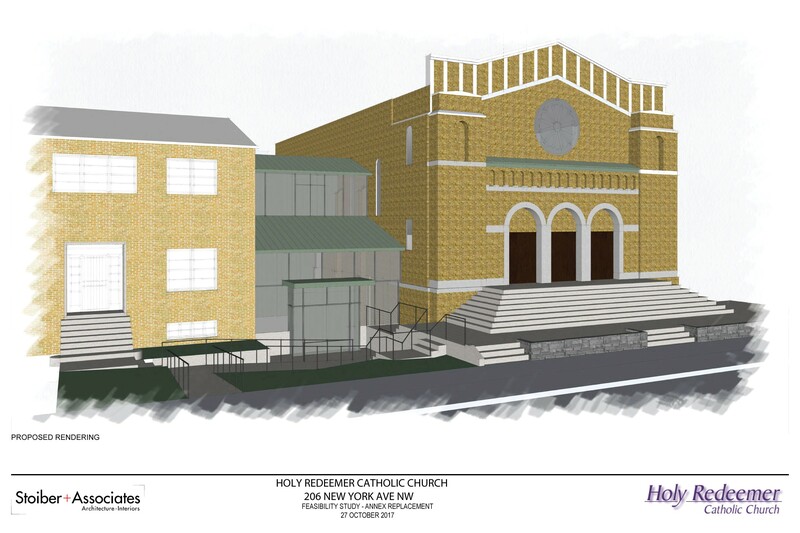 A new welcome annex with an elevator will make all parts of Holy Redeemer accessible to people with disabilities from both the front and the rear of the church. Our parishioners and visitors should all be able to be part of worship in the sanctuary if they wish to. The steps prevent that from happening. A new welcome annex will be located between the existing rectory and the church building and will provide elevator service for visitors between three levels: the sanctuary, the lower level of the rectory offices and meeting rooms and the social hall. Glass enclosed, the new welcome annex will be accessible from the public sidewalk on New York Avenue with a new ramp and accessible from the rear parking lot for drop off of visitors, with accessible parking spaces. The elevator design will also accommodate casket access to the main sanctuary.